Abaris will have stock of the long awaited Petzl Avao Bod Croll Fast harness tomorrow (4 April 2013) – We will be the first in UK to have stock but stock coming into UK is limited so we advise ordering soon to guarantee swift delivery (normally next day if ordered before midday). Worth noting for those who already know the Petzl Navaho range is that there is now a big difference between the Avao ‘Bod’ versions (Avao Bod, Avao Bod Fast and Avao Bod Croll Fast) and the component parts of the full body harness (made up of either a Avao Sit or Avao Sit Fast and a Top or Top Croll). The Navaho Bod and Bod Croll Fasts used to be exactly the same as the Navaho Sit and Top / Top Croll combination except that if you bought the separate components then the top part was missing the rear dorsal attachment, now if you buy the ‘Bod’ version you get a one-piece harness (you cannot separate the sit harness from the top) with the webbing from the top element of the harness forming an X on the back of the user and being interlinking with the leg loops (it slides freely through the waistbelt webbing and is designed to ensure the user is in a better position when suspended from either the sternal or dorsal attachment point). One other important change to be aware of is that the Avao Bod Croll Fast sizing is different to the Navaho Bod (and the Avao Bod and Bod Fast for that matter). There are now a size 0 and a size 1, size 0 is for a small adult (waist 23.6 – 35 inch / height 160-180cm – also consider wearing the harness with winter clothing or overalls), size 1 is probably best for a normal ‘frame’ (waist 27 – 43 inch / height 165-185cm). Petzl have produced a comprehensive guide to their ASAP back-up device. The guide not only shows the correct methods of use, how to reduce the risk of dropping but also shows some of the more innovative uses of an ASAP such as using it in an inverted position when using it as a back-up for a top belay. To download the guide either go to the download section on the Petzl ASAP page of our site or directly here. IRATA have recently released the latest version of the Code of Practice for their members which will be of interest to most rope access companies regardless of whether they are IRATA members or not. The code of practice gives recommendations and guidance on the use of IRATA International rope access methods, including training, to provide a safe system of work. 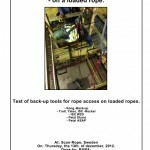 Please note that this code of practice is NOT intended to apply to the use of rope-based access methods for leisure activities, arboriculture, general steeplejack methods or emergency personal evacuation systems, or to the use of rope-based access (line rescue) techniques by fire brigades and other emergency services for rescue work or for rescue training.